I was nine or ten years old when I first read Aesop’s Fables. It was from an exchange library that my 5th grade English teacher made compulsory. Each of my classmates gave a book to it which we loved to read, and every two weeks, we would take a new book from it. Aesop’s Fables was the first book I took out from the many that were in the “lucky draw” box. It was this book, and the library that made me realize I loved to read, and I have not forgotten these evergreen, moral showing tales even after these many years. 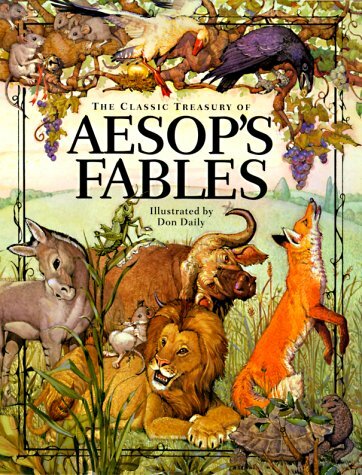 Aesop’s Fables gave me fun stories to read… evergreen tales of wit, wisdom and enjoyment. I think stories like The Town Mouse and the Country Mouse, The Fox and the Grapes, The Milkmaid and her Pail, The Wind and the Sun, The Goose with the Golden Eggs… these are unforgettable to those who have read it, and we’d recollect them to our children too. At that age, I wasn’t very much after the moral part, but I think it helped my parents that these stories taught that too, and they used to quote from them, teach me what they meant, and I’d smile as I understood. I share a gist of few stories. The Goose with the Golden Eggs is the story of a farmer, who finds a golden egg in his goose’s nest. It happens each day, and he’s happy with all the riches that come his way. However he gets greedy, and wanting all the riches at one go, he cuts open the goose, and loses the riches he would have got with patience. The Fox and the Grapes is the story of a fox who sees a bunch of grapes dangling high above him in the orchard, and jumps at it, trying a lot till he realizes that the grapes is too far for him to jump. He calls the grapes sour, and moves on. The Crow and the Pitcher (who wouldn’t have read this one?!) is the story of a thirsty crow, who sees a little water at the bottom of a pitcher, that he can’t reach. Rather than give up and go away, he sees a few pebbles on the ground and puts them into the pitcher, one by one till the water rises to the top, and he can quench his thirst. The number of fables credited to Aesop are many, over five hundred. Many publishers have over the years selected from them at random and published them. These books are available from as little as Rs. 50. These stories would be a part of childhood reading that would be unforgettable. @Arpita, I started the challenge with "A Village by the Sea", just before the birthday wish post :) Thank you for the welcome and for liking my nom-de-plume. @FL, yeah :D its one of the evergreen children's books! so u r in Bangalore for the Indimeet?!! these stories never grow old , do they ? Love them always !